David, you are originally from the UK? You moved to Austin, TX last summer 2012, didn’t you – and we found you via EuroCircle if I recall correctly? Yes, I was born and raised on the Lytham St. Annes, in the north-west of England. As cheesy as it sounds, I moved to America to live the American Dream. I was determined to succeed in business and knew this was the country to do it in. I just had to pick the right city to call home and to launch my startup Uberpong. I chose Austin and arrived here in February 2012. I found EuroCircle whilst networking like crazy after getting here. I knew one person so had to get out there and hustle! Did you move with a spouse/children? I moved here with my wife Diana. Why did you move; what do you do so everyone knows that? What do you enjoy most about Austin, now when you have more experience, how’s the quality of life compared to UK? Quality of life is a lot better than the UK. People work hard here but make a point to have a life outside of work. With 300 days of sunshine, people are passionate about cycling, tennis, running and of course ping pong!! Usually there are some negatives, what are the ones for Austin that really stand out for you personally? Myself and my wife are allergic to dogs so the massive amount here and fact that a lot of bars and restaurants let them inside the venues has been testing. The city is not designed for walking and with the mounting traffic congestion, the city badly needs a mass transit system. The drivers are very aggressive here and drive erratically. Almost everyone I see either talks or texts on their phones whilst driving which is alarming. I miss culture and proximity of England to mainland Europe. Do you feel Austin is a good place for you as an entrepreneur right now? Are there any areas expats like you might like in the USA in your opinion (entrepreneurs? WHY? Yes. San Francisco is a little saturated but I hear Vcs/angels back startups faster than in Austin. This has to change if Austin is to truly become the next startup hotspot in the US. It is also a little frustrating that the majority of networking events are for tech industry people. 2/10. Buses very infrequent but on time. Metrorail has a bizarre route going east instead of through downtown and over to South Congress. I don’t drive but I feel the pressure of not having a car. Which are the best places/suburbs to live in Austin as an expat? Hard to say. We started in downtown as that’s where the majority of events happen & I’ve met a few Europeans at these. We are keen to move to Rosedale as it has a nice community feel without being in surburbia. It really depends what you’re in to. Do you go out a lot – hobbies? Or is everything about work right now? Uberpong just got Nike as a client and we are directing a huge event in San Francisco next month that will feature Apple and be at the new headquarters of Airbnb. 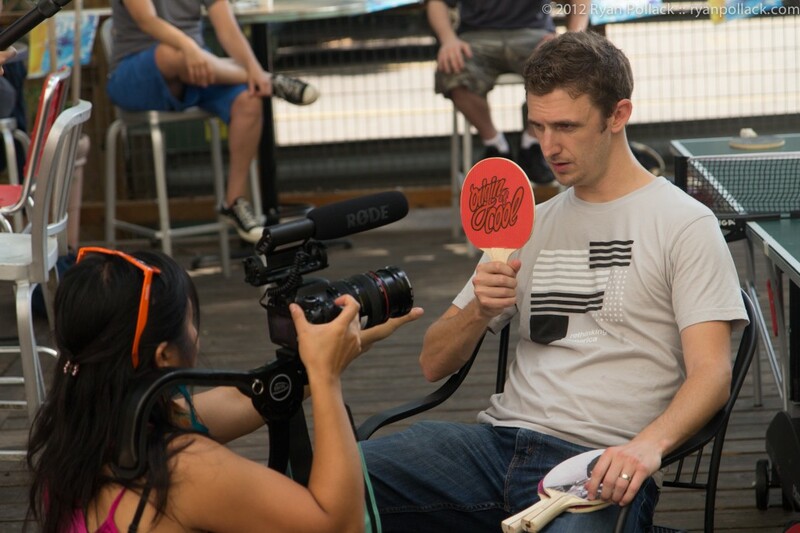 We are also releasing a new Uberpong branded paddle very soon. Add to that a big distribution deal that could be happening with my other company OriginofCool.com. I feel like I’m hitting a workaholic phase but you’ll find me at my favorite local bar Tiniest Bar In Texas chilling out at the weekend! The cost of living is actually a lot higher than I expected in Austin and the rental rates and property prices are skyrocketing. Eating out is generally cheaper in Austin but when you add the tip on, it can come close to London. Gas prices are lower. What are the locals like; do you feel you mix mainly with other expats? I guess this is a bit easier for you since you speak with a wonderful British accent! Very laissez-faire and not bothered with what people think. They actually don’t make a big deal about the accent compared to other states in the US. I mix mainly with people from the north-east of the USA but have a few friends from Austin. I have a South African friend who is the drummer in my band but apart from that only really see expats at EuroCircle. It depends where you hang out. Compared to London, definitely yes. What’s the economic climate like in Austin, how would you compare it to the UK? Why? How does the work culture differ from UK? Buoyant. People will frequently ask, “What recession?” Salaries are lower than most states but so is the living cost (although this is rising fast). Texas has survived the recession well and I think the UK could learn a lot from Austin. I run Uberpong and have never worked in a US company. I gather that dress code is generally very informal due to the heat. My work style drifts dramatically between smart/casual for meetings, networking events and interviews to ridiculously casual for photo shoots and everyday work. I thought the police would be very relaxed but heard they can be brutal (my friend got a fine for jaywalking on an empty street and another friend was racially abused when he got pulled over for no reason). Do you think your career (business) would be the same in UK – or does this work better for you? Either way, please explain more. No. I stand out more here for several reasons and I like the low operating costs, the tax breaks and general entrepreneurial mentality of the people. They believe things can happen and see opportunity rather than risk (the British typically think the opposite way). What are your favorite restaurants/bars here in Austin – why ? Tiniest Bar In Texas – low key, my kind of music (alt/psych rock) & nice bar staff. Ruth’s Chris – we know them well & they always look after us. Rounders Pizza – good movies/vibe/music. Easy Tiger – for ping pong. Is there any other advice you would like to offer new expat arrivals or contemplating a move to Austin? Say yes to any invite you get when you first get here. Get to know the locals and key players and just get stuck in and enjoy life here!! !